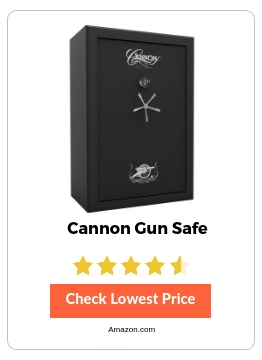 Cannon Gun Safe Reviews - Best Selling Cannon Gun Safes 2019! With the unprecedented growth in crime rates all over the world it is no easy feat to ensure complete security of your valuables. Protect your precious belongings from the dangers of theft, burglary or any other natural disaster with the ultra-strong Cannon gun safes. 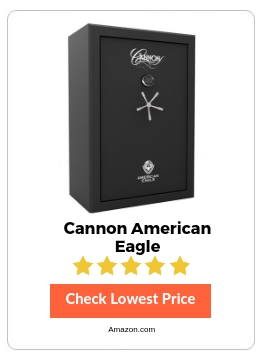 No doubt Cannon gun safes are one of the most widely used gun safe brand in the world and you can opt for Cannon Safe American Eagle without doing any further research if price of gun safe is not barrier for you. 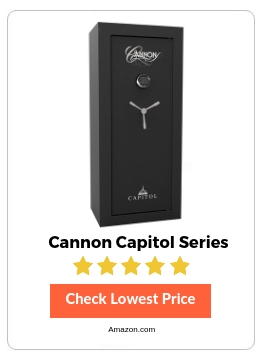 However if you are low on budget, we would recommend the Cannon Captiol Series which is value for money and comes with great features and durability of course. Used primarily to store guns and ammunitions, these tough cabinets prevent any unauthorised access and can easily store important stuff like ammunitions, cash or jewellery. 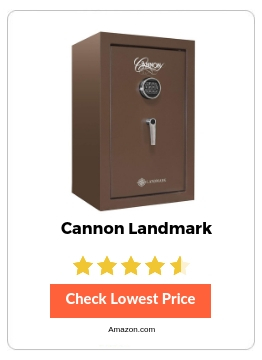 A key player in the Gun safes market, Cannon has been in business for almost 45 years and is known for its medium sized gun safes. An ideal choice for both personal and professional use, Cannon’s range of gun safes is a rage in the market, complemented by excellent services and supreme quality. 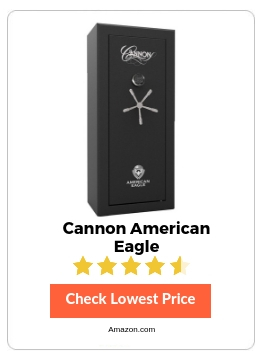 Now that you’re interested in Cannon gun safes (a very smart choice indeed) you’d probably want to know more about what products the brand has to offer. Check out the best cannon gun safe models and recent launches to get a better idea. Read through a brief review of each product and decide for yourselves. This premium quality safe is the ideal solution to your valuables security and safety. It combines the toughness of the material used and the elegance it has for home use. This safe is suitable for gun storage as well as other valuables such as money and jewelry. The safe is designed with optimal security in mind to protect your valuables and rifles. It has the Cannon’s patented tru-lock internal hinges for functionality and safety. Additionally, the safe features a triple fin seal which works to protect from the intumescent cold smoke. The gun safe has been tested for fire resistance which shows it has a 30-minute fire rating. This is standard and guarantees that your valuables are safe even in the event of sudden flames. For an even high-security feature, the safe comes with six 4-inch locking bolts which are backed up but the replacement guarantee. If you are looking for a safe that blends in well with your interiors, then this is the right one for you. It comes in a sleek black color that goes well with any home theme. The safe is pretty easy to use with the proper security settings. It is of reasonable sizing to hold valuable items; thanks to the compact yet accessible design. The interior of the Captiol Safe has your needs in mind. It features adjustable shelving so you can create a custom look inside for maximum use of interior space. This element makes it useful for storing multiple items including different sizes of guns. With the three-spoke handle and the electric lock, you are sure your valuables are safe. 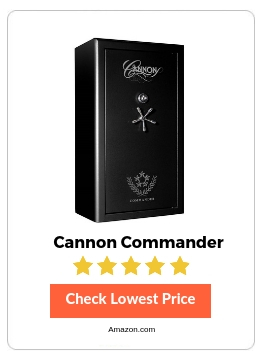 If you are looking for a safe that guarantees safety in the event of extreme fires, then this Cannon Commander CO43 is the right bet. The design and the safety features of this safe make it ideal for home and commercial use. It is a combination of high security and high fire protection. This safe is one of the highest in quality and security in the market. It has a verified fire rating of 1200 degrees Fahrenheit for 90 minutes which ensures it has a high protection feature. With the triple-fin intumescent cold smoke expandable seal and the heat-activated door seal add on to the security of your valuables. The safe’s style is designed to match most interior themes for suitability in different homes. The safe’s design features a two-step door which provides an additional barrier for a more sealing surface. The door is massive and has a 5 5/8 inches thickness for extra security. It is made of high-quality steel and has a double design for additional safety. The safe has 1.5 inches locking bolts for the top, side and bottom which makes it easy to set up. With the high-security commercial grade electronic lock, you are sure your guns are safe all through. The steel hard-plate made of 3 layers protects the lock from unauthorized access. The 5-spoke handles operate smoothly for easy access to the safe. The patented tru-lock hinges ensure the safe door is securely attached and inaccessible unless the electronic security is set up. 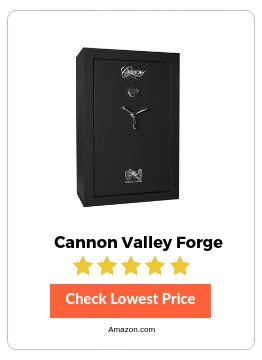 The Cannon Valley Forge safe is ideal for its easy access electronic safety system. The design suits home use and have adequate space for many guns and other valuables. It combines an elegant style with high protection features for a seamless experience using it for your home. The safe comes with high-quality construction utilizing 14-gauge steel for the entire structure. It has a 12-gauge steel door with true-lock internal hinges for strength. Additionally, the hinges use four 4-inch locking bolts to ensure the bolts do not pry. With the electronic lock that has a protective triple hard plate prevents drilling or any other stress for access. One of the features that stand out with this safe is the triple-fin smoke seal that expands to prevent damage in the event of smoke or fire. The interior of the safe is upholstered for an attractive look and a safe surface for your rifles. Additionally, the interior has two adjustable shelves and an extra organizational panel on the door for maximum use of the space. The safe has a 3-spoke chrome handle which adds to the style and functionality. The design incorporates predrilled holes which make it easy to anchor the safe in place with additional hardware. The safe comes with batteries for compete function after installation. The electronic lock of the Cannon Valley Forge safe is easy to use and works well for home use. All the features of this safe give it an upper hand for home use; thanks to its compact size considering it can hold up to 42 guns. 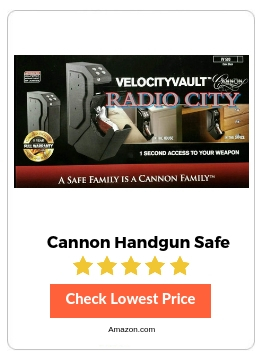 If you are looking for a compact size handgun safe that guarantees optimal protection, then this Cannon Velocity Vault Handgun safe is the ideal choice. It is designed for single-gun storage and keeps up to the promise of quality. It is suitable for home, car or office use. One of the guiding factors when selecting an ideal handgun safe is the quality of the structure. This safe features 18-gauge steel construction for added security and protection of your handgun. It has a revolutionary design which makes it suitable to store up to full-frame pistol sizes. It has a drop down design for easy access when needed. This safe has multiple mounting options to suit your style and works well for high-security properties. It has a high strength lock mechanism which ensures your valuables are safe every time you access the safe. The durable construction makes it protected from prying or any destruction stress that might arise. The drop-down drawer has a fast activation for additional security. The safe features patented no-eyes keypad makes it easy to access your valuables without worrying about any security leakage even in the dark. The safe comes with two override keys to ensure you access the safe without the code. The interior has soft foam padding to protect your gun or other valuables from scratches. Since this Handgun safe operates on batteries for the electronic lock, it ensures you can access your gun when needed. It has a low battery indicator to let you know when you need to replace the batteries for functionality. Once the lock is activated, the interior lights up for visibility in low light or dark situations. The design, security features and access mechanisms make this safe suitable for home use. This Cannon safe is an excellent solution to all your valuables storage problems. It has a massive interior to provide ample space for you to store a mix of guns and other valuables without worrying about failed security. Easy to install, this safe is the perfect choice for both commercial and household use. This Cannon safe is a mix of luxury and functionality for protection of your firearms. It has a sturdy steel construction for strength and optimal security for a long duration of time. This safe accommodates up to 48 guns of different sizes and designs to provide an all-in-one storage solution for your valuable firearms. The interior is upholstered to protect your firearms from scratches or dents. The safe is a high-security choice; thanks to the high fire rating. It provides the protection in case of fire and smoke ensuring they remain intact in such situations. The safe has a dual stage triple-fin door seal which adds on to the security of the structure. With the patented tru-lock internal hinges, you are sure the door remains intact and not even drilling will access the safe’s interior. The safe has a quick access electronic lock which makes it suitable for home use. The design also features ten 4″ locking bolts which ensure secure closure of the safe for maximum protection of the guns. It also has a three-spoke chrome handle. The interior has adjustable shelving so you can customize to suit your needs. The gun safe comes in a striking black or charcoal color to suit your interior décor. This Cannon safe model offers the top luxury security features to protect your guns and other valuables. It is designed for easy use at home with a handy electronic lock system for easy access and convenience. It is undoubtedly one of the most preferred home safes for multiple storage solutions. This safe has a 90-minute fire rating which ensures the interiors remain under 350 degrees for up to 90 minutes during a fire. This protection makes it ideal for home use and can help to protect firearms and other valuables in such situations. The three-layered steel hard plates protect the lock from drilling which adds on to the security of the safe. The double-sided rugged steel pieces stop burglars from altering the lock to gain access. The safe has an electronic lock system for quick access. In the event the system is disabled, you can access it using the mechanical protection system. This feature adds on to the safety of your valuables at all times when you need to access the safe. The safe features a media box which comes with two 110 outlets and two USB plugs for convenient electronic storage. The interior of the safe has soft padding which ensures your valuables remain free from scratches. It provides adjustable shelving for customized storage of different items. Additionally, the safe has a door organizer kit to maximize on storage space. The gun safe has twelve 4” locking bolts with tru-lock internal hinges for additional security. The triple-fin smoke seal, a re-locker and the hard plates protect the lock from damage. When the door opens, the interior lights up to allow easy access in low-light situations. This Cannon Gun Safe provides a safe place to store your guns and other valuables without worrying about unauthorized access. It has ample storage space to suits different rifles and additional area for other valuables including jewelry. The safe has a high-security locking mechanism to ensure your valuables remain secure. The design features patented tru-lock internal hinges which work best to prevent unauthorized access. The triple-hard plate prevents drill attacks or any other kind of pressure that the safe might face. The ten 4” locking bolts ensure the door is securely attached to the frame for added security. The safe has a 60-minute fire rating which guarantees the safety of your guns and other valuables in a fire incidence. Additionally, it has a triple-fin intumescent seal to protect the safe from smoke damage. With the handy electronic locking mechanism, you can be sure your guns are safe, and no one can access it without the codes. It has strong locking bolts and a solid steel door for maximum security of your firearms. The Gun Safe comes in a sleek black color which makes it ideal for any space. The interior is upholstered to ensure the guns remain free from scratches or dents. Like other Cannon safes, this one has adjustable shelving to allow customizing of the storage space to suit individual needs. This feature makes it suitable for multiple items storage including jewelry. Also, its compact design makes it ideal for home use with a guarantee of safe and adequate storage space. One of the features that stand out with this Cannon safe is the sizing which makes it suitable for home use or office use. It is designed to fit into tight spaces but still provide ample storage space for your firearms. This, plus the sturdy design makes it the ideal choice for a long-term storage solution. The safe comes with essential features to protect your gun and other valuables for a long time. The design features a 12-gauge steel door for durability. Also, the door has a patented tru-lock hinge with 4” long locking bolts for additional security. These are safety attached to ensure secure closer and resistance for maximum protection. The safe operates on an electronic keypad lock which provides convenient access. It is easy to set up, and you can change up the code combinations as you wish. If the batteries die, the system will remember the exact combination as soon as you load up new batteries. In the event of a fire, the safe will hold up and protect your valuables for up to 60 minutes. The triple-fin door seal swells to block out smoke when a fire starts. This safe is designed for customizable storage of your valuables. It comes with two adjustable height shelves for organized storage. Also, it provides additional space on the door interior for more contents. The door organizer has pouches and expandable pockets to fit in different sizes of items for safe storage. The entire interior of this Cannon Gun Safe is upholstered to ensure all your valuables remain in the right condition. These features together with the high-quality steel construction make the safe ideal for home, office or other commercial properties. A dependable option, CA23 Cannon Deluxe Fire Safe is easy on the eyes as well as your pocket! It is fire resistant and protects your valuables from any danger. The tough frame and design make it the perfect to protect your treasured belongings. It has been subjected to many fire endurance tests and offers an amazing resistance to 1200 degree F up to a whopping 60 minutes! This has been verified by Intertek-ETL. Also it offers a sturdy titanium coated locks and handle along with a door that is almost impenetrable with 4 inches of thick steel. The aesthetically pleasing design with elegant handmade pin strips would match perfectly with any decor. The Tru-Rack security system with multiple shelves that can adjust and accommodate your stuff accordingly is replete with many wonderful features to ensure complete protection of your items. The reliable Cannon EMP lock that works both electronically and manually, it even gives you more than enough space for proper storage of your high-value goods. Whether you’re a gun collector or want to secure your treasured cash and jewellery you can always trust the Cannon EX40 series! The intelligent design provides premium quality security to all your valuables, making this safe tough, fire resistant, and capable to prevent any burglary or theft. Check Out the Amazing Features! It even has the TruLock hinges that are in-built, a speciality of Cannon. This premium quality P22HR-H1TEC-13 Patriot Series safe launched by Cannon is one of the best and most recommended products in the market. A perfect mix of elegance and toughness, the Patriot series safes ensure a hundred percent protection of your valuables. Dependable and durable, the solid steel framework is impenetrable. It comes with a chic and sophisticated logo of the Patriot series with silk screens. Available in many beautiful designs and colors, this is one safe that you cannot afford to miss! The Home Essential series launched by Cannon is an ideal choice for people who want to safeguard their valuables in their homes. Available in a wide variety of shapes, sizes and colors you can get the perfect safe that matches with your home’s interiors. It has successfully passed many fire resistance tests and can endure amazingly high degrees for 60 mins! The spacious interiors and stylish exteriors along with adjustable shelves, handles and intelligent locking makes it all the more desirable. The biggest advantage offered by this safe is its compactness of design. It doesn’t really require much space but ensures 100 percent security of the valuables stored. Fire resistant, it can endure surprisingly high degrees up to 75 minutes. This has been approved and certified by ETL. A favourite among most users across the globe, Cannon has now become a household name. Cannon gun safes are known for their supreme quality services and tough performance. The brand stands for honesty and hard work, two very important qualities that any company must adopt and implement. Also at Cannon, the products are constantly reinvented and upgraded keeping up with the latest technology and demands of the market making its safes the choice of one and all! Based on experts’ opinions we have compiled here market’s Best Cannon Gun Safes to choose one. Follow this guide to know everything about Cannon Gun Safes.